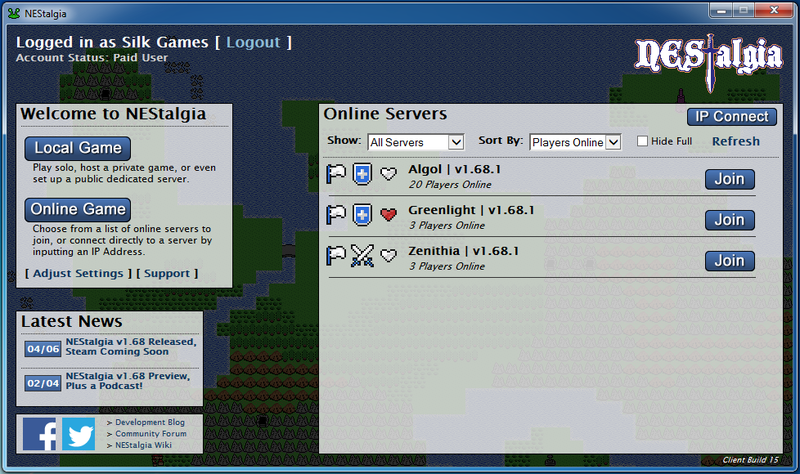 NEStalgia can be installed and played on almost any Windows PC with an internet connection, including netbooks. We don't yet have a Mac version available, but we're working on it! After installing the game you will be prompted to create a free user account within the launcher (or sign in with an existing account). If you have a friend who owns NEStalgia, you can try the game for free by downloading the client and joining his or her private server via Direct IP Connection. Windows XP, Vista, 7, 8, or 10. DirectX 9 or higher, Internet Connection. NEStalgia was developed using the BYOND game creation tools, which is why BYOND.com hosts and manages our user account database. To purchase NEStalgia you must first create a free BYOND account. This can be done on the BYOND website or via the NEStalgia Launcher. NEStalgia purchases are processed through BYOND as well. Clicking the link on the right will take you to the NEStalgia subscription page on BYOND.com. Your NEStalgia purchase activates immediately; if you're logged in to the game when you subscribe, simply log out and restart the game for the purchase to take effect. NEStalgia subscriptions are a one-time $15 purchase.